Olas Atlas is a beautiful brand new ocean view home in Las Conchas. This home has breathtaking views and is conveniently located right across the street from the beach. The home has 4 bedrooms and 3-1/2 bathrooms with accommodations for up to 8 guests. The home has a 2nd level viewing deck which has a palm frond palapa shade. 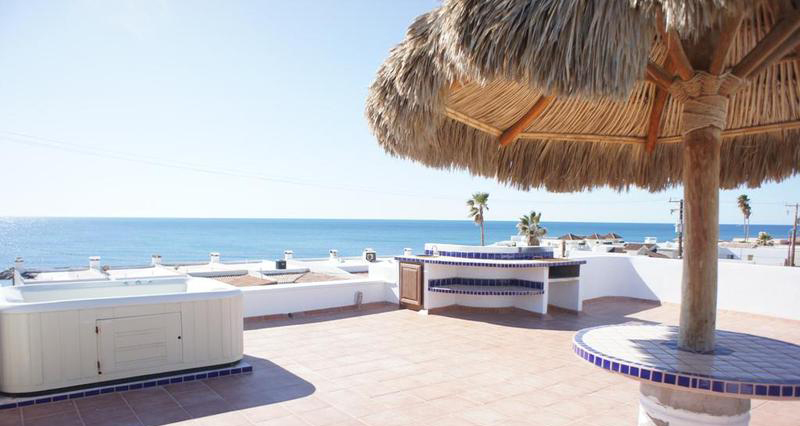 You could kick back in the spa with a cold beer or margarita and watch the sunset over the Sea of Cortez. You could also soak up the sun with a good book and feel the warm salty air kiss your skin. The possibilities are endless at Olas Atlas. The living room in the home is furnished with a beautiful sofa and love seat set, lighted end tables and a glass top coffee table. The room also has a dark wood media center that is furnished with a large TV, DVD, VCR and a CD player. After a long day at the beach or bars you can pop in a movie or continue the festivities with music CD’s that you bring from home. The walls of the living room are appropriately adorned with wood framed wall mounted art pieces and there are several vibrant green silk potted plants that give the room a very tropical feel. The dining room is furnished with a beautiful table and chairs that can seat 8 guests. The wall behind the dining table has a wall mounted wood framed mirror that gives the room a very spacious feel. The kitchen in the home is very large and spacious with brand new white on white appliances, granite counter tops and back splash, and raised panel oak wood cabinets. There is a window above the sink that illuminates the kitchen with natural light and many counter top conveniences to make your stay very comfortable. The counter top has a butcher block, coffee maker, blender and toaster. The cabinets are filled with all the cookware, dishes, glasses and bowls while the drawers are loaded with cutlery, silver ware and serving utensils. The kitchen also has a breakfast bar with stools where you can read the paper while you enjoy your morning coffee. All the bedrooms in the home are furnished with queen size wood framed beds that have beautiful bedding sets, lighted bed side tables, dresser and a huge double door closet to hang your clothing. The master bedroom has an especially wonderful ocean view window. All the bathrooms are equipped with double and single mirrored sink vanities that have walk in showers and a commode. The home comes with cold AC, heat, and many ceiling fans, as well as hot and cold running water. You can take a walk across the street to the beach and set up your umbrella and towels and soak up the sun’s rays. You may want to take a relaxing walk on the beach, collect sea shells or build a sandcastle. You could even let the kids bury you in the sand. This is a wonderful home in Las Conchas and you will not be disappointed with the accommodations. You should check now for rates and availability. Note: Jacuzzi is not available. Pets are welcome with a $25 USD pet friendly fee..
10/10/15 12:49pm Carlo a Lady the new person in charge needs to be rewarded for her wonderful service. She goes way above the call of duty. 07/15/13 12:09pm Nicholas Next time if you could send somebody to turn on the ac of the house in the morning, it will be great. Tv was not plugged to an antenna but we had a great time and next time that we go, we are going to trust seaside reservations for our accommodation. 05/30/17 08:01pm Sabrina The staff was very friendly and was available when needed. I would definitely book another weekend getaway with SeaSide! 02/25/19 05:59pm Robert The maid service in housekeeping could be a little better. We were told there would be blankets in each bedroom, they were all in the master bedroom and weren't found until after we froze the first night. We called the OWNER and she told us where to find the blankets - housekeeping should have had that taken care of before hand.